Eighteen-year-old Charlotte (Jinx), fights her past to chase her dream of becoming an Elite Nordic Airre pilot, yet her rebellious attitude hinders her hard-earned lead status. Overcoming a string of life-altering events and the unwanted advances of Ghost Allen, a smooth talking pilot, is one thing, evading death at the hands of two comrades is another. When Jinx comes face-to-face with an unlikely ally, she is forced to trust him in order to escape the clutches of those who want to silence her. Can a once broken girl transform her past into an iron will, or will she ultimately crumble under the destruction? I froze. My thoughts instantly drew a large coiling snake at my feet, but then a gentle wipe of his thumb swept across my cheek. I jerked away in response. “What are you doing?” I covered his path with my hand, as if the man-germs burned me. There was a tease in his tone. “What situation?” I asked. “And I’m not. Trust me.” I displayed the most repulsed expression I could. The hem of his shirt pulled up over his crossed arms and cleared his head. “Whoa.” My palms few up. “You’re reading the signs all wrong. Put your shirt back on,” I pleaded to him. My eyes widened, soaking up the definition of his stomach. Holy abs. “You like what you see?” He laughed, waggling his eyebrows. I gained my composure and mocked a laugh. “I was just thinking you’re almost as toned as I am. Close, but not quite there yet, big guy,” I said, patting his stomach. His closed lipped dimpled smile awakened something inside of me. The same smile I saw the morning on Senders Rock, the one that sent tingles through my body. I wanted to pull my eyes away. But he was beautiful. A.C. grew up climbing trees and spying on her siblings. When not writing, A.C. can be found cheering on her favorite girls at a softball field or sitting in her car reading at practices and eating her hidden stash of chocolate. She enjoys family time, traveling, random road trips, watching movies, decorating, and trying new cocktails. She lives in the mitten state with her husband, two daughters, and their furbabies. 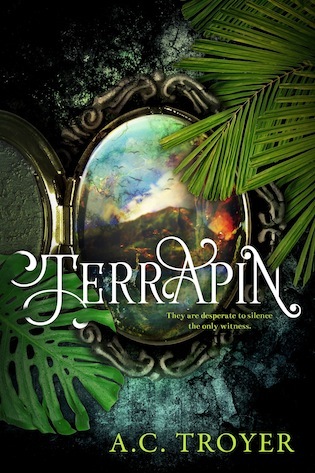 Terrapin is her first novel.